GIVEN THAT founder and driving force Malcolm Young can no longer play music owing to dementia, AC/DC would have been forgiven for calling it a day. 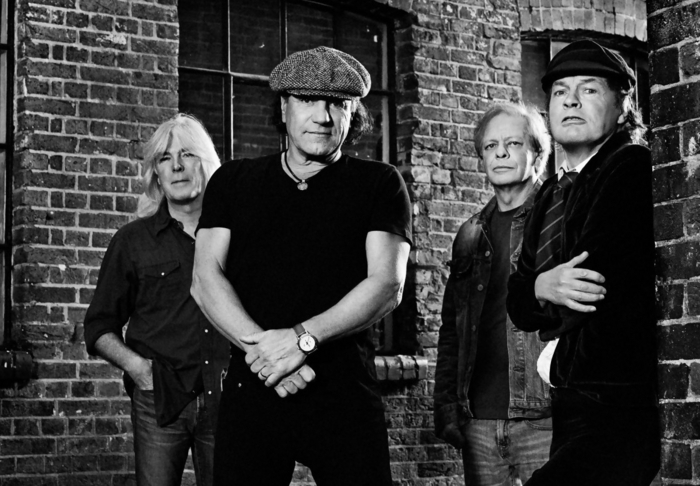 However AC/DC are resilient and have overcome tragedy before, and with Mal’s blessing, and help from cousin Stevie Young (replacing Mal on rhythm guitar ), they have produced Rock or Bust, the adverse circumstances doing nothing to dent the strong, late-period, run the Aussies have been on since Ballbreaker. Adverse circumstances also account for this being the shortest AC/DC album (at 35 minutes ), but that in turn allows the band to deliver a tight, focused, lean, and frill-free set of rock based blues. AC/DC have always known the power of the dramatic pause (‘Whole Lotta Rosie’, ‘Back in Black’, ‘Rock’n’Roll Train’ ) and the title track, which opens the album, has the sort of gargantuan sounding chords punctuated by just such pauses, to get the hairs standing on the back of the neck, and the song itself is a killer. Other highlights include the sprightly ‘Play Ball’, the atmospheric ‘Dogs Of War’, the strutting blues of ‘Emission Control’, and the intense, exciting, ‘Baptism Of Fire’. While nothing else on Rock or Bust may match them, and while we’re not talking Let There Be Rock or even an Indian summer triumph like Black Ice, the remaining songs are very satisfying and Rock or Bust more than earns its place in any true AC/DC fan’s collection, in whatever format you prefer.